This outdoor bark control unit is designed for easy hanging or mounting on a tree, wall or fence post to keep your own dog or your neighbor’s dog from barking. 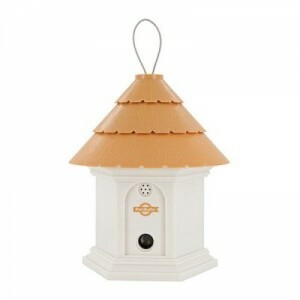 When the Outdoor Bark Control Birdhouse unit is placed within range of a constant barking dog, an internal microphone detects the barking sounds and the unit is activated. The unit emits an ultrasonic sound that can only be heard by the dog. When the dog is startled by the high-pitched sound, it should stop barking as it will associate its bark with this unpleasant noise. The unit includes a digital timer that can be programmed to turn the unit on and off at specific times, just like an alarm clock. Soyez le premier à laisser votre avis sur “Deluxe Outdoor Bark Deterrent” Annuler la réponse.